How to calculate Loan to Value? This Loan to Value calculator (or LTV calculator for short) finds the proportion between the loan you need to take and the price of the purchased property. It can also determine the loan amount from the down payment and the LTV. If you're interested in finances, you can take a look at our partially amortized load calculator. Otherwise, keep reading to learn how to calculate the Loan to Value ratio! Imagine that you want to buy a house. You can't afford it, though, unless you take a mortgage - the property costs $200,000. You have analyzed your finances and decided that you have $20,000 available for the down payment. LTV describes what is the ratio between the loan amount and the total purchase price. It means that, in this case, you will have to follow the steps below. This LTV calculator uses two simple formulas to determine the LTV of a transaction. You can use it in multiple ways - for example, you can input the LTV and total price of the property, and let this tool figure out the other two values. Intuitively, the total purchase price is the sum of the down payment (the sum of money you are able to pay from your account) and the loan that the bank lends to you. 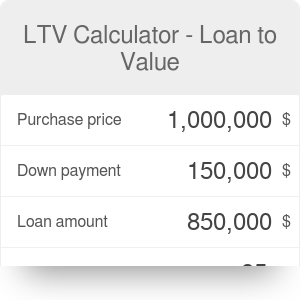 As mentioned earlier, this LTV calculator defines the Loan to Value ratio as the loan divided by the purchase price, expressed as a percentage. LTV Calculator - Loan to Value can be embedded on your website to enrich the content you wrote and make it easier for your visitors to understand your message.